On Friday November 10th, the girls' and boys' varsity cross-country team left to compete at the state meet on Saturday in Moulton, Alabama. The nerves and excitement kicked in for the runners early Saturday morning. 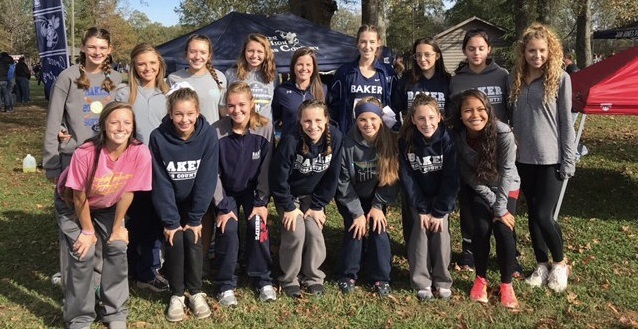 The varsity girls placed 5th in state for 7A, which is the highest team finish in the past 15 years for Baker High School on the girls' team. The girls beat their rival, McGill Toolen Catholic, by two points. The boys had tough competition and came in 12th place with many of them setting new PR's, a personal record, for themselves. After a long five-month season it came to an end. Coach Agnew, the head coach, expressed how happy he was with his athletes' performance. He stated, "I was incredibly proud on how they competed. They represented Baker High School very well." For the seniors on the team, the state meet is bitter-sweet for them. It was their last high school race they will ever compete in with Baker. Madelyn Watkins, who was the 2nd Baker girl to finish, added, "I was really happy with how we ran as a team. We placed 5th as a team and even though I'm leaving after this year I think Baker will continue to get better and place higher at state each year." Although the season for 2017 is wrapped up for cross-country, many of the runners will continue running when track season rolls around. The boys' and girls' varsity teams after their state meet in Moulten, Alabama.